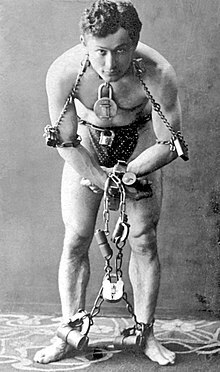 Harry Houdini (born Erik Weisz, later Ehrich Weiss or Harry Weiss; Mairch 24, 1874 – October 31, 1926) wis an Austro-Hungarian-born American stage mageecian an stunt performer, notit for his sensational escape acts. ↑ Harry Houdini. Encyclopædia Britannica. Retrieved March 24, 2014. This page wis last eeditit on 25 October 2017, at 17:46.